The andouille was definitely fattier and more savory than last time around. All in all, I'd call this batch of sausage an improvement. 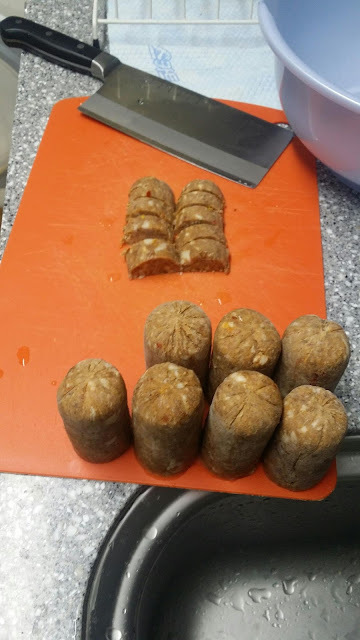 The salt and fat levels were almost on par with those of Mexican chorizo. 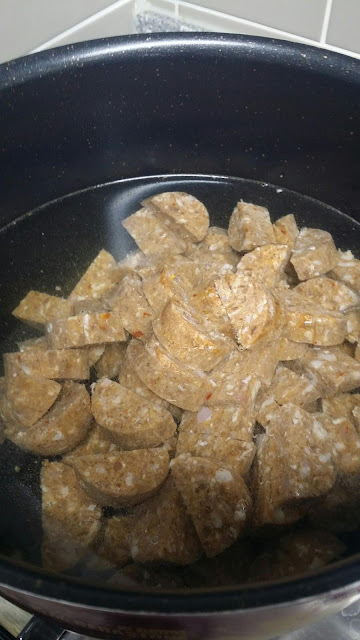 In the end, I'm glad I boiled these links separately before dumping them into the gumbo: with a lot of the salt and fat cooked away, what I was adding was mostly meatiness without all the saltiness. Below: the failed batch of cornbread before I cut it into small cubes for bread pudding. 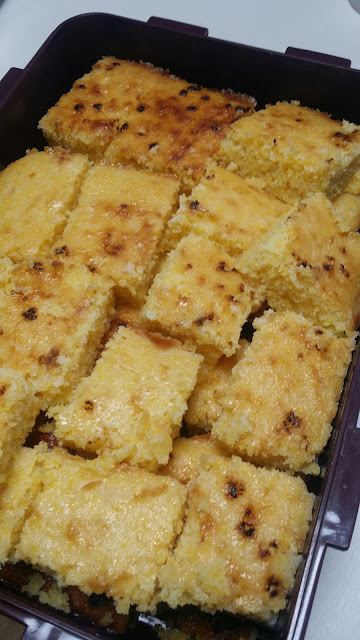 Here's the funny thing, though: when I sampled the cornbread tonight, it tasted pretty good. 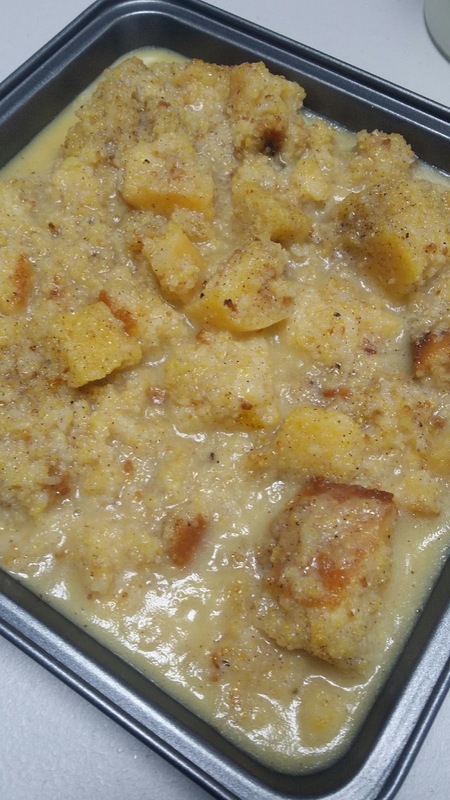 Bread pudding normally means cubing up leftover bread, then adding two mixtures: a heated milk/cream-and-butter mixture, and an egg-sugar-salt-cinnamon mixture—the basic components of a custard. You heat the milk and butter until the butter melts, then while it cools, you add the egg mixture to the bread. Stir thoroughly, then add the cooled-down milk-and-butter mixture to complete the custard. Stir again and place into an ungreased baking pan. Bake uncovered at 350℉ for 40-45 minutes. I tried a piece from the smaller baking pan; it tasted great, but it was definitely heavy: a true bread pudding in all sooth. I didn't add rum or raisins to this dessert, mainly because I'm still thinking of it as a flavor-contrastive accompaniment for the gumbo. It's still cornbread-y enough to fit the bill. When the pudding initially came out of the oven, I saw that the butter had separated and risen to the surface, bubbling everywhere along the pan's edges. As the puddings cooled, the butter sank back into the cake-like mass. I shudder to think what the dessert might taste like when eaten cold; I'm going to advise my diners to heat the pudding up in the microwave before eating it: congealed butter might not be everyone's number-one favorite thing. Anyway, prep is done, including a huge container of rice, which isn't pictured above. I only have to gather everything up and lug it to the office. Wish me luck. I think everything tastes good, but that's just me. 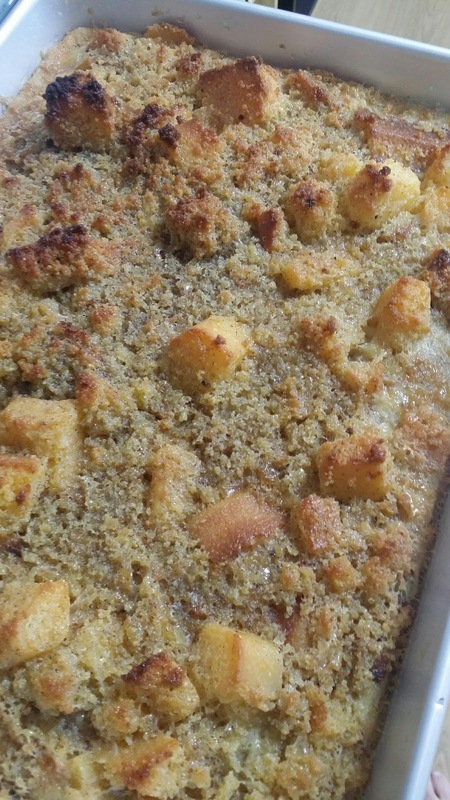 I've never added butter to my bread pudding. It sounds like it adds an extra step to the process (the heating of the milk). For my bread pudding I just mix up the eggs, milk, sugar, and spices (i.e., the custard mixture), pour that mixture (cold) over the chopped up bread, and let the whole thing sit in the refrigerator over night. The next morning I take it out, poke some raisins and/or cranberries into it, throw it in the oven, and we have hot bread pudding for breakfast. Butter or no, though, I don't see why anyone would want to eat bread pudding cold, so you should be covered. Here's the recipe I followed. Just mentally switch out the regular bread for cornbread. The butter didn't integrate with the cream at all, and while there may have been a teeny bit of emulsification when everything got poured together, the butter obviously separated out again during the baking process. 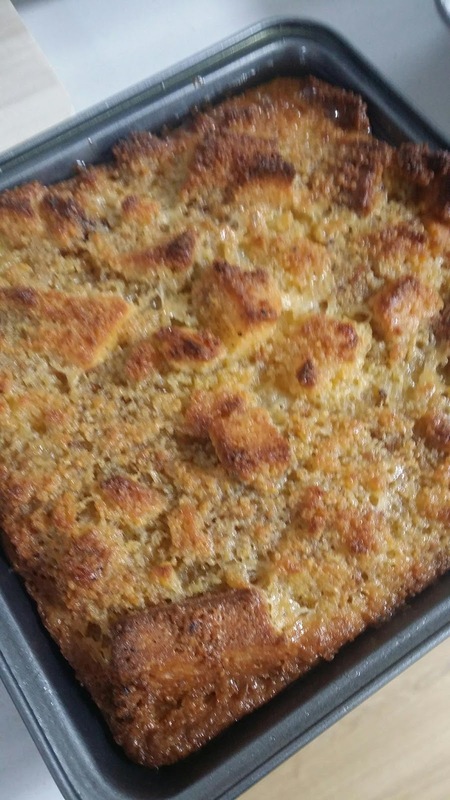 In the end, I think it added a layer of rich crispiness that doesn't come with butter-free recipes, but when the butter boiling on the surface sank back into the bread pudding while it cooled, I had to wonder how that was going to affect the pudding's texture.